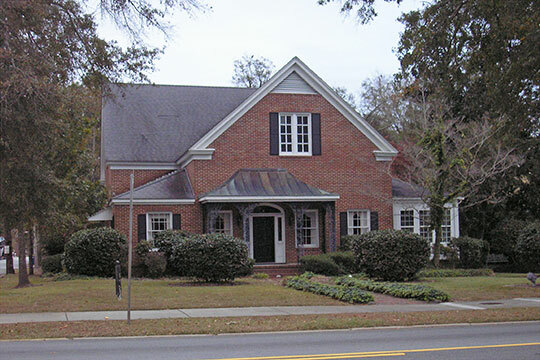 Statesboro City Hall is located at 50 East Main Street, Statesboro, GA 30458; phone: 912-764-5468. Photo: James Alonzo Brannen House, ca. 1881, 112 South Main Street, Statesboro, GA. The Historic District was listed on the National Register of Historic Places in 1984. Photographed by user:Blastoids (own work), 2013, [cc-by-3.0 (creativecommons.org/licenses/by/3.0)], via Wikimedia Commons, accessed February, 2016. Statesboro was incorporated in 1866. It is home to Georgia Southern University. Statesboro was laid out in 1803 as the seat of Bulloch County, but records of the superior court show that its first session was held here in 1797. During the American Revolution the Whig settlers, outraged by the raids and encroachments of Daniel McGirth, a Tory spy, cornered McGirth and his followers in a swamp nearby and killed many of them. This act rid the settlement of Tory sympathizers. Statesboro was on the line of General Sherman's march to the sea during the Civil War, and Federal soldiers encamped here for a short time. The town has a meat-cutting plant, gins, lumber mills, cotton warehouses and wholesale grocery and produce houses. Because of the abundance of deer, ducks, quail and doves in the Ogeechee River Valley, Statesboro attracts many Georgia sportsmen during the hunting season.